Reluctantly we made our way back to La Paz and managed to dock the big boat without losing our damage deposit. Everyone was worried that I'd run her aground but I kept my eye on the depth sounder and waited for Bernie to retrieve his hat he lost as he took the whaler in before I docked. We removed our stores except for one very bad bottle of Sangro de Cristo. Another crew was there to take the boat for another week and we spent some time explaining the systems that we'd taken a week to figure out. We stayed at a nice little hotel for a couple of days and wandered around La Paz getting our land legs back, debriefing. Even though the boat was a little bit cranky and the nightly winds were stressful the crew held together very well. Everyone got along. There were plenty of hands to do the work and the time was spent relaxingly well. Couldn't have asked for better weather. Flat blue water. Motoring slowly. Sitting under the shade talking. We made our way to Bahia San Gabriel and dropped our last anchor for the trip. I was horsing around in the whaler, kicking out the jams, taking her out for a last ride before coming back for dinner prep. Chris and I kept bugging Keith to get in and go fast but he shook his head at us like we were children. Finally when we weren't looking he slipped into the whaler and took off like a rocket. Always a boy. 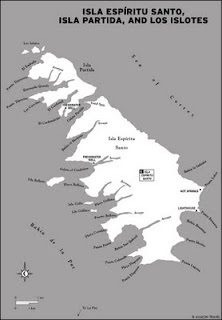 Looking for a good nights sleep, we headed about 8 NM north to San Evaristo. Here is a sheltered bay, nestled up against the Baja mainland with a steep protective rise of mountains to the west. A beautiful little anchorage and small fishing village. There were quite a few sailboats anchored and the holding seemed quite good. Some of our crew went ashore then returned with fresh fish. We had a wonderful peaceful dinner. Around 11 PM the winds started up and became fierce. We thought we'd be protected but the winds came roaring down the hills. There was very little wave action but the winds must have been 30 knots. Up in the middle of the night I could see across the harbor and every boat was stretched hard against the rode, every flag was streaming flat towards the east. Of course I worried all night about the anchor giving way. Lessons learned: Keep an anchor watch. Don't expect winds in other places to behave like in Puget Sound. When the crew goes to shore, it is business time. After leaving Isla San Francisco we anchored for a few hours near Laguna San Jose and took small boats into the mangrove. 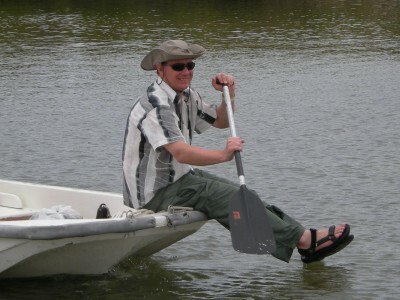 The water was shallow in places so we had to tip up the outboard on the whaler and paddle. 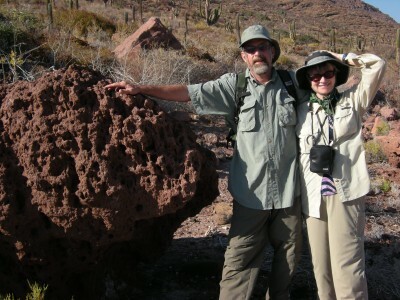 Then later we took a hike into the cactus forest and along the beach. 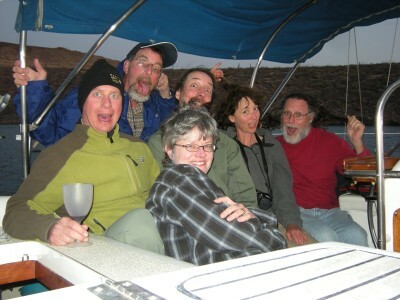 After swimming with the sea lions we had a nice sail north to Isla San Francisco. About 18 NM. It was a little windy on the east side of the island but we figured when the westerlies came around in the evening we'd be protected. Not many boats were in the big bay. Turns out that it was pretty windy the night before and most everyone had a good scare and ran for cover the next morning. Good beach walk. Dry Dry Dry. Crunchy. 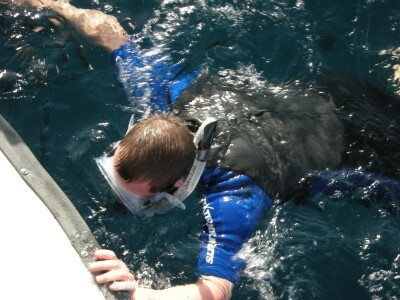 Getting back in the boat was fun with the swim platform jumping up and down about four feet with each roller. I'd nose the whaler near Sea Scrape's stern with a passenger poised to jump. Jump they would and we eventually all made it one at a time. Once the nose got caught under the swim platform and got doused. Good way to sink a whaler! A couple we met on the beach were also returning to their boat. They jumped aboard from the beam instead of the stern. They got their lines ready then waited for the boat to roll towards them. One mate then stepped onto the boat and held the lines then the other stepped aboard on the next swell. Lessons learned: The bow and stern travel more vertical distance than the beam of a boat at a bouncy anchorage. We bounced the anchor around Bahia San Gabriel for a little while before getting it set then had our first dinner aboard. Lovely. Later that night the Coromuel winds picked up and we spent a rough night hanging on in our berths as Sea Scrape tossed her head back and forth fighting the anchor chain. The men in the Vee were kept up all night by the anchor chain popping on the bow roller. Connie and I in the aft cabin were kept up all night by the dinghy banging against the stern of the boat. Seascrape would charge off to port swinging way out to one side before getting jerked to a stop. The Dinghy would then ram into the stern just inches away from our heads. The Sea scrape would dash off on the other tack to repeat its little dance step. Keith and Lisa didn't sleep either as they were kept up by the combination of noises coming from port, starboard, aft, forward, above and below. Towards dawn the wind subsided and we all slept. Lesson learned: When the anchorage gets roily, keep an anchor watch. Tie the tender off with bow and stern lines and fenders. Hold on tight when you get up in the middle of the night to pee off the stern. 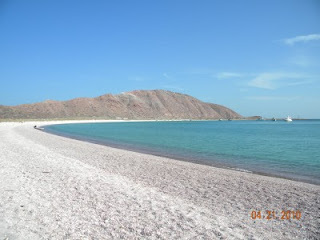 Our plan was to cruise the eastern shores of Isla Espiritu Santo and Isla Partida then head north to visit Isla San Francisco before returning to La Paz. We anchored at Caleta Partida the second night. Like everyone else we made a stop at Los Islotes to see the sea lions. By day three we still had a good supply of limes and it looked like we'd have ice and rum to last the week. Things were looking up. And so we got to learn the Morgan 41. A favorite of charterers, this charming tub of a boat has a wonderful layout above and below decks. The aft cabin is comfortable with a good size berth and separate head. Forward in the Vee are two bunks with adjoining head and amidships is a roomy saloon and galley. There is a walk-through connection to the aft cabin and a large engine room under the cockpit. Stairs from the saloon and the aft cabin take you to the center cockpit above deck. There is plenty of room to lounge about in the cockpit with wide side decks and a roomy aft deck with swim platform. We towed a whaler along behind and had two kayaks strapped on deck. SeaScape is ketch rigged and easy to sail. Performance under sail was adequate as long as you didn't want to sail upwind. We missed a couple of tacks when trying to come about in light winds and so learned to do an engine assisted tack in light air. Captain Bob Moore who owned the Morgan 41 unexpectedly died the day before we traveled to La Paz. Bob fell off a ladder and succumbed to his injuries. Bob's demise certainly put a pall on our adventurous spirit as we waited for Mike, a grieving friend of the family, to come pick us up at the airport. Mike arrived and deposited us at the dock and we proceeded to load our gear and complete our provisioning. 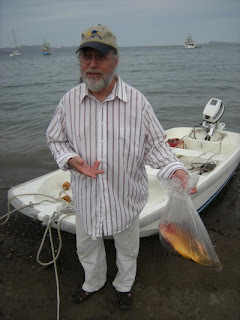 At the local "CCC" market (Centro Commercial California) we found everything we needed for a week on the water. At check out we found that our credit cards were refused for the large dollar amounts we wanted to spend. Lesson learned: Buy in small amounts or bring a lot of cash... and maybe tell your credit card company to expect large purchases from out of the country. Back at the dock, we were pretty much on our own to figure out all the little switches and levers and valves on the Morgan 41. 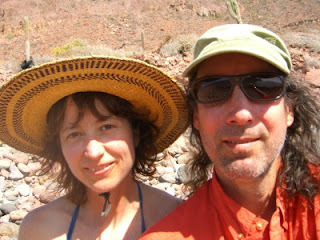 Figure it out we did and the next morning we were off to Isla Espiritu Santos. This was the first time I'd driven a boat of that size so it was quite the challenge pulling off the appearance of confidence and nonchalance. On the way to the Islands we negotiated the exit from La Paz then started off across the Bahia de La Paz on a beam reach. Hours later, realizing that we were getting nowhere near our destination we turned her into the wind, cranked up the engine and headed straight at the islands in the distance. We saw a strange floating object and went to investigate. Chris, on the bow, saw the float then saw the polypropylene line floating off downwind. He swept his arm vigorously to the south and Keith, at the helm, spun the wheel hard over. 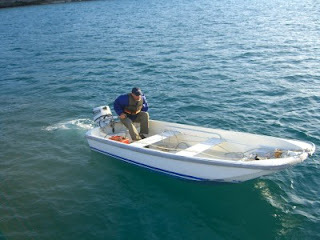 The old Morgan with her full keel does not spin on a dime so we ran over the line and wrapped it around the prop shaft. Dead in the water we dug out snorkeling gear and prepared Chris to do the dive. He dove down with a knife in his teeth and cut it away abrading his shoulder on all the crustaceans living happily on the hull of our dear Morgan 41, SeaScape, hereafter called "SeaScrape". Keith found this guy in La Paz Mexico who charters out his old Morgan 41. We scraped up the money and reserved the boat. On April 17, 2010 Connie and I, along with Keith, his wife Lisa and our third partner Chris flew to LAX and while changing planes met up with my brother Bernie from Nashville Tennessee. 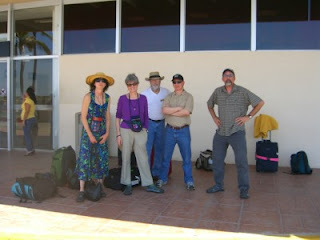 The six of us then flew on to La Paz for a nice little 10 day adventure. In the picture you see from left... Connie, Lisa, brother Bernie, Chris, and Keith. We have no idea what we're in for but we are in great spirits. When the plane opens up after landing and you feel that hot air sweep through the cabin your body just sighs with relief. Mmmmm, this is gonna be nice. 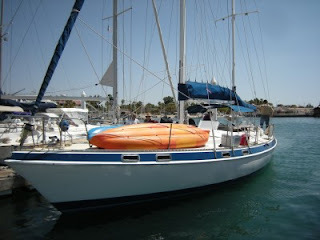 We bought Platpus, a Newport 27, in 2005, splitting the costs between three owners, Chris, Keith and I. I've sailed that boat all around Puget Sound, down to Olympia and north into Canada. Our longest trip was north through the Straits of Georgia and Johnstone Strait to the Broughton Archipelago. I'll be giving up my share of dear Platpus and transferring ownership to my buddy Bill Dock. We sure have had our share of cold water, beer drinking sailing on Platypus. I'd been sailing around Puget Sound for quite a few years with some longer trips up the inside of Vancouver Island. Sailing out of La Paz seemed like the logical next step. What is it like to sail in warm waters? 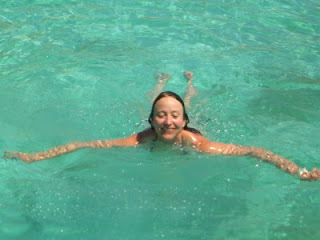 Would warm waters sooth the soul? Thus far our sailing had us in foul weather gear most of the time. 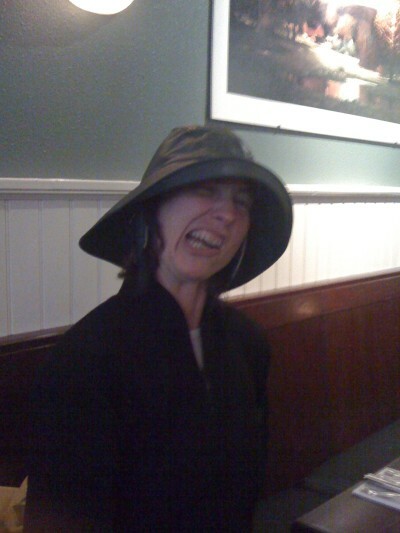 In the cold windy winter months we'd sail across to Kingston and head to the pub to warm up. We'd talk about other ports we'd like to see and ponder just how that might come about. Here's Connie looking her best after a particularly rough crossing.